Learn more about this kid friendly salon -- complete with fun themed chairs and an indoor playground -- that’s fun for adults and children alike! 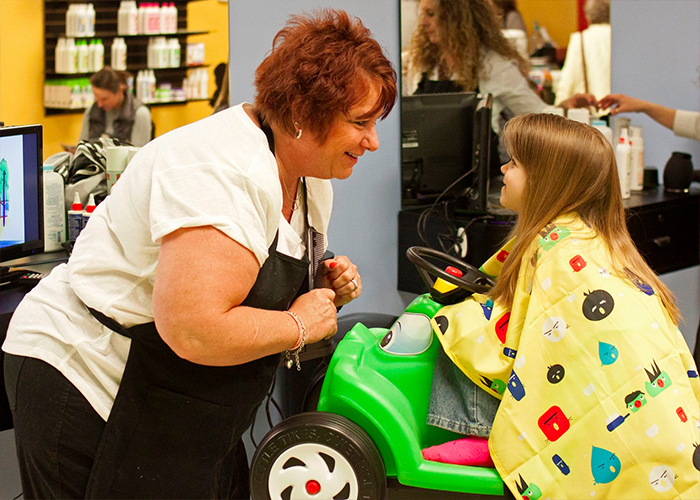 In March 2014, Sarah Callihan and her husband opened the doors to what is now Junior Cuts. Located in the Recreations Outlet in Milford, the salon offers access to an indoor playground while you wait and fun chairs ranging from cars to full-sized salon chairs for teens and adults. As strategy consultants and business owners, the Callihans knew where and how to perfect a business concept all the way through execution. “We had the ability to offer something different and better,” says Sarah, adding that before their arrival on the market, there weren’t many kid-focused salon options. Junior Cuts is decorated to appeal to kids without being overwhelming to adults. Each station has a TV to provide the kids with entertainment and each stylist is primped to keep the child amused and occupied. In addition, each stylist has special training with Applied Behavioral Services for children with autism and sensory process disabilities. For infants, Junior Cuts has provided special supportive chairs for those who haven’t developed enough to sit up on their own yet. Junior Cuts recently earned the Hulafrog “Most Loved Kids’ Haircut and Salon” award twice and the Best of Parenting Award this past December. Callihan foresees future growth within the business due to the rising amount of clients and appointments being made weekly. If the growth continues, the Callihans have considered the idea of expanding and opening up other branches, and at this success rate it is not improbable. As of right now, though, they’re working on perfecting their current concept. In the near future, they do plan on the prospect of “glamor parties” for kids and/or birthday party events. Being that they’ve had a few in the past, which have proven to have good turn outs, they’d like to continue on with similar functions. A new addition to Junior Cuts is its newly launched Story Time series. They’ve partnered with Clermont County Public Library and have readings every Tuesday at 11:00 a.m., and are sometimes lucky enough to snag a few local authors! For more information, visit www.juniorcuts.com. 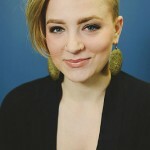 Editorial Intern - Shealyn Hoehn is currently finishing up a Bachelor's in English Literature with a minor in Women, Gender, and Sexuality Studies at the University of Cincinnati. As an editorial intern for Cincy Chic, she is responsible for writing articles and submitting ten new story ideas per week. Shealyn is the Editor-in-Chief of UC's undergraduate literary magazine and she hopes to one day become Anna Wintour's predecessor as Editor-in-Chief of Vogue – and with that take over fashion as we know it. In the meantime, though, Shealyn remains studying and tutoring at the Academic Writing Center in addition to her budding writing career as an aspiring author. Contact her at shoehn@cincychic.com.